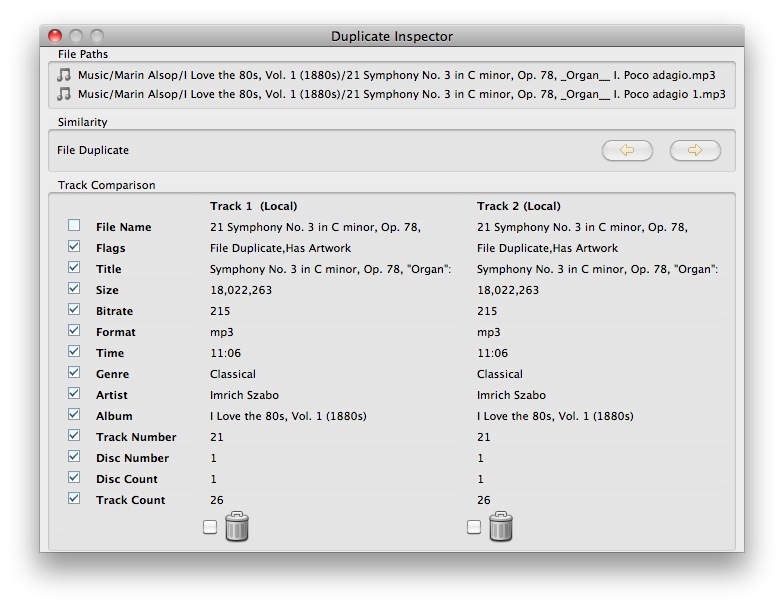 The Duplicate Inspector lets you quickly view and compare duplicate tracks (or tracks that are possibly duplicates). Bring up the Track Compare window by selecting one or two tracks and select "Compare Tracks..." from the action menu or by right-clicking the tracks. If you select two tracks, those tracks will be compared. If you select a single track, it will compare it with a duplicate track. If you have any possible duplicate tracks, you can use feature to help decide which track to keep. The window will show track details such as File Name, CRC, Size, etc are shown side by side so you can easily determine which file to keep. When you decide to delete one of the songs, simply enable/check the Trash icon underneath the song you want to delete. This will put the song in SuperSync's Trash. For more information about removing duplicates, see Duplicate Removal.